On Thursday, April 11th, two CK senior athletes were joined by their families, coaches, teammates, and administrators as they signed letters of intent to play soccer at the college level. Each student has made great achievements during their time at Cranbrook and will be using their talents to compete at the college level. Zach Buvalic will be attending Rose-Hulman Institute of Technology in Terre Haute, Indiana. Tony Yazbeck will be joining the Hornets of Kalamazoo College in Kalamazoo, Michigan. 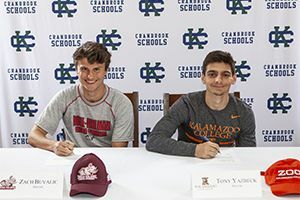 Best of luck to these students as they continue their athletic careers after graduating from Cranbrook. Go Cranes!